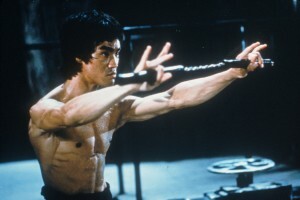 A martial arts weapon, the nunchaku or nunchucks, renowned for knocking out Bruce Lee’s adversaries, has increasingly popularized within America’s police forces. Most recently, the police department of a Northern California township has equipped its 20 officers with the device, made of two hard plastic bars connected by a nylon cord. The Anderson Police Department says the tool offers a more versatile alternative to traditional batons with the opportunity to better protect officers and safely restrain combative individuals. “It gives us the ability to control a suspect instead of striking them,” Police Sgt. Casey Day, said to the Los Angeles Times. Starting in the 1980s, nunchucks have since been sold to more than 75 departments across 14 states, a third of which are in California. While some departments have found success, others have discontinued their use. In 1989, Los Angeles Police Department ordered 130 nunchucks to deal with a series of anti-abortion protests, whose members blocked access to abortion clinics. But two years later, the department abandoned its use after more than 30 protesters sued over a wide range of injuries inflicted from the officers wielding tool, including broken arms and legs, strained necks, and damaged nerves. “The department is concerned about the public perception of their using a tool some people feel is a tool of excessive force,” the former Deputy City Attorney said at the time. But the Anderson Police Department believes, with proper training, those concerns should not arise. Officers won’t be required to maneuver a weapon with such rapid, unexpected strikes, but if they do, Day says they must complete a 16-hour training program. Left: Bruce Lee, master of martial arts, could show police a thing or two about nunchucks. Photo by Fotos International/Archive Photos/Getty Images.